I came across an article in the magazine Planning with the intriguing headline, "commute by freeway and save energy." I had just finished reading a great story by Jay Walljasper on non-motorized transportation in the same issue, so I thought I would give this one a chance. Nope. For the life of me, I can't figure out how this proposal would do anything but add to the energy consumption of our current suburban commuting patterns. Maybe I'm missing something here. 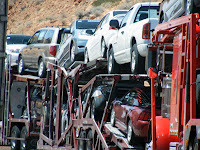 The idea is to use 18-wheeler car carriers, the ones that dealerships use to cart empty cars around, to carry suburban commuters and their cars into the city for work. You would just drive from home to a loading station, dock yourself onto a truck with 6 -13 other cars, ride on the freeway to the city, unload and drive the rest of the way to work. Just like that. So how does this system save energy? The idea is that these drivers would be using small, energy-efficient vehicles. Super. But this assumption is independent of the whole idea - if you've already switched to a SMART car why throw this massive truck into the mix? Now you not only have to use energy to cart your own car across the metro region each day, but you're responsible for at least 1/14 of a tractor trailer as well. "One driver can haul up to 14 small cars"
As opposed to 0 drivers if they just drove their own cars. Or if they took a bus, 1 driver could carry 50+ passengers and there would be no need to transport extraneous tonnage of steel to and from work. "During transit, the land carrier's photovoltaic panels can charge the vehicles batteries, and provide power for lights, radio, laptops, and so on." You could also slap a photovoltaic panel on a bus and share the energy generated more efficiently between all of the passengers. Or just put one on each individual car for that matter (once again, this suggestion is entirely independent of the whole car carrier idea). "No commuter parking lots required." Just lots more parking in the city, where the space is already apt to be tighter. And then you have to park these 18-wheelers somewhere too. "The land carrier could serve double duty as mail carriers, thus reducing truck traffic on U.S. highways." Does the U.S. postal service want to distribute mail in massive trailers designed to hold automobiles? How would they navigate residential streets? Even if there was a way to coordinate the shifting needs of these two entirely different systems, it would result in no reduction whatsoever in truck traffic. The trucks would just be different - and probably bigger. "To fund the land carrier system, I would look to the federal Department of Transportation, which now provides up to 80 percent of the money for many rail and bus transit systems." Good catch! PLANNING, huh? And these are the people that certify us..(sigh)...A much more efficient contraption already invented, duh, and in use is called a bus. 14 vs. 88...do that math. Don't forget the cost of paying the driver. Perhaps a great idea for folks who just can't leave their laptops and blackberrys alone for 5 min., let alone be bothered to socialize with meatspace people ...but most folks in the burbs nowadays certainly can't afford the extra cost of that driver. The only value I see in this is the convenience of the drivers and the reduction of congestion compared to all those drivers driving separately. Dear lord. This is one bizarre idea.